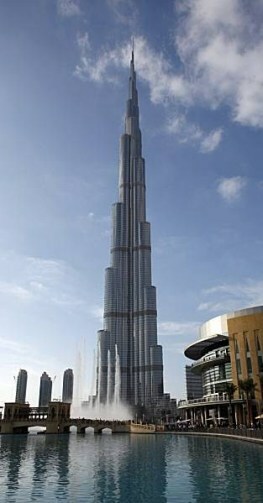 The world’s tallest building opened today, and already they’ve changed its name. Known throughout its years of construction as Burj Dubai (“Dubai Tower” in Arabic), the 2,717-foot-tall behemoth is now officially Burj Khalifa (“Tower Named After the Rich Dude Who Loaned Us Money” in Arabic). The switch in nomenclature honors Sheik Khalifa bin Zayed Al Nahyan, president of the United Arab Emirates, whose infusion of petroleum cash enabled debt-ridden Dubai to complete the tower. To give us some perspective, Burj Khalifa stands twice the height of the Empire State Building, and rises more than 50 stories higher than America’s tallest building, Willis Tower (which used to be known as Sears Tower until it was renamed last year… must be a thing with supertall buildings). The tallest building that I personally have ever been inside is the Stratosphere Tower in Las Vegas. For someone as acutely acrophobic as I am — I’m uncomfortable just climbing or descending stairs — standing on the observation deck at the Strat was one of the most terrifying experiences of my life. So if I ever make it to Dubai — and yes, it’s on my bucket list — I’ll probably content myself with admiring the Burj from ground level. I will, however, buy the T-shirt. Explore posts in the same categories: Aimless Riffing, Ripped From the Headlines, That's Cool! This entry was posted on January 4, 2010 at 12:34 pm and is filed under Aimless Riffing, Ripped From the Headlines, That's Cool!. You can subscribe via RSS 2.0 feed to this post's comments. You can comment below, or link to this permanent URL from your own site.